At Flower Window Boxes we are helping to transform the window box industry as your affordable no rot solution to window box gardening. Our Charleston window boxes are made from a no rot PVC material that looks, paints, and feels identical to wood. Get the look of wood and avoid all the maintenance. Benefits include: * Does not absorb moisture * Does not peel paint * Does not split, splinter, warp, or twist * Does not rot ever - 100% Lifetime Guarantee Standard Dimensions: 8" High x 8.75" Wide x 60" Long Trim adds 1.5" to the total length. SHIPS FULLY ASSEMBLED Drain holes are placed in the bottom for easy drainage. Click to learn how to install window boxes in a safe, secure, and reliable manner. Go direct with Flower Window Boxes and get quality products and direct rates. We provide standard and custom PVC window boxes at unbeatable prices and we get them delivered to you faster than anybody else. Our window boxes have even been featured on The Today Show as "the last window boxes you will ever buy!" Boxes come in standard white ready to be painted with any exterior latex paint or they can be left unpainted. 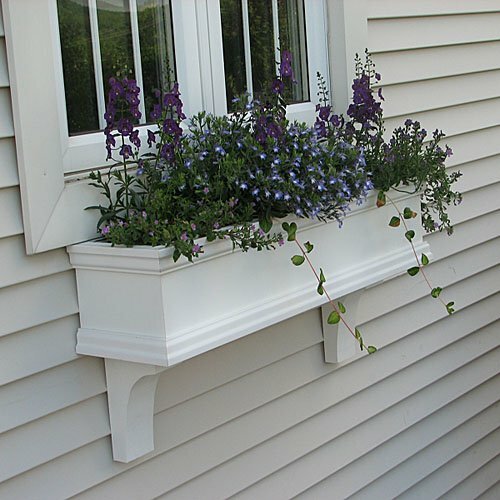 Window box brackets are decorative only and not required, but greatly enhance the look of our boxes. Lag bolt installation through the back of the box is recommended - Call for details. Installation instructions included. Easy and convenient self-watering reservoir inserts can be added and will cut your watering frequency by four-fold saving you time and making maintenance for vacations and those with busy lifestyles easy! Only available at Flower Window Boxes!